Residence or Business? *: Delivery address is in a business zone. Each column is capable of lifting 18,000 pounds. In a tandem of 4, that means 72,000 pounds of lifting capacity. 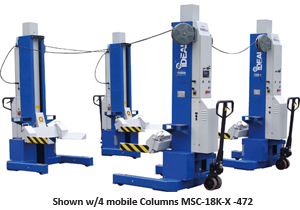 The iDeal MSC-18K-X is available in sets of two, four and six columns to provide up to 108,000lbs. of lifting capacity. 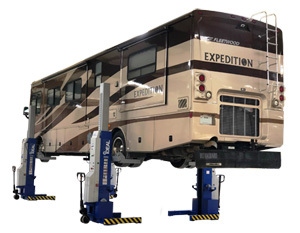 The MSC-18K-X is designed to lift fire trucks, school buses and other large commercial vehicles by the wheels. Optional accessories provide the flexibility to lift pickup trucks and wheels free lifting for expanded service. Technicians realize improved productivity through safe, simple operation of the lift at each column using the well-designed control panel. 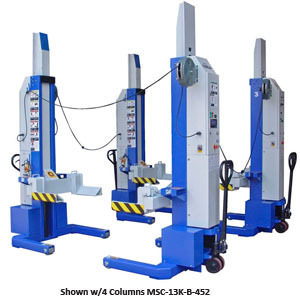 The mobile design and quick set up of the MSC-18K-X allows technicians to easily transform a flat bay to a lift bay for improved use of shop space. The small foot print of the MSC-18K-X allows for storage without impacting valuable shop space. Column Height Min 88.6" / Max 155.5"
Fork Adjustable Range 12.6" - 22"
Fork to Column Clearance 10"
Max Distance Betwwen Columns 32' 8"